In an era of shrinking library acquisitions budgets, the Center is pleased to announce that the funds in a number of our specifically designated book endowments are available for the purchase of materials for the UConn library in order to make them available for the teaching and research of Judaic Studies. We ask that faculty send us the relevant publication information so that we can assemble a list of these requests and purchase them for the Homer Babbidge Library. Please contact the Center at judaicstudies@uconn.edu. Two founding supporters of the Center for Judaic Studies and Contemporary Jewish Life at the University, Doris and Simon Konover of West Hartford, will endow the Center’s first faculty chair. 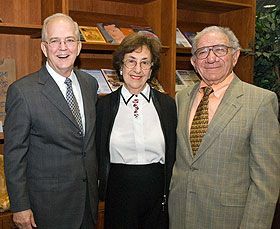 The Doris and Simon Konover Chair of Judaic Studies will support teaching and research by a leading scholar of Jewish life, history, and religion. 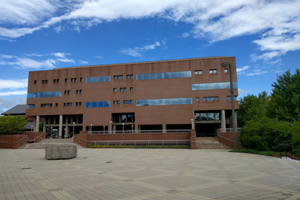 The endowment of a chair will enable the Center, which has just celebrated its 25th anniversary, to attract a scholar with an international reputation to develop new courses and provide research leadership in the field of Judaic Studies. Parking is available in the North and South garages on campus. Garage rates are $1/hr after 5pm and $2/hr before 5pm. After 5:00 pm, visitors may park in any on-campus space not designated as reserved, restricted or limited. The Yiddish Tish luncheon discussion group, led by Professor Arnold Dashefsky, will meet in the Dodd Research Center, room 104. The Yiddish Tish luncheon discussion group is a small, intimate gathering of members from the community and campus who meet monthly to read and speak Yiddish. These sessions are open to any and all faculty, staff, students, and community members. All reading and speaking levels are welcome. Please bring a bag lunch, and we will provide dessert and drinks! The Yiddish Tish is a program of the Center for Judaic Studies and Contemporary Jewish Life at UConn. If you require an accommodation to participate, please contact Pamela Weathers at pamela.weathers@uconn.edu or 860-486-2271. UCLA Professor David N. Myers will present "Mass Displacement in the Mid-Twentieth Century: A Comparative Look at Europe and the Middle East" for the Center for Judaic Studies and Contemporary Jewish Life Annual Academic Convocation on the Holocaust. The lecture is made possible by the I. Martin and Janet M. Fierberg Fund that supports lectures at the Center for Judaic Studies and Contemporary Jewish Life. Co-sponsors include the American Studies Program, the History Department, the Human Rights Institute, the Humanities Institute, the Department of Literatures, Cultures, and Languages, the Middle East Studies Program, and the Thomas J. Dodd Research Center. A reception will immediately follow. The current moment of massive population displacement in the world leads us to seek out historical precedents and explanations. Most immediately, the Second World War and its aftermath come to mind, when millions of people were displaced, rendered homeless or repopulated. This talk will explore one particular strand in this post-WWII history, inquiring whether there was a causal relationship between an act of displacement in one context and another elsewhere. More particularly, the lecture will focus on the relationship among three significant population displacements in the 1940s stretching from Europe to the Middle East: first, the phenomenon of European Jewish DPs in the wake of the Holocaust; second, the displacement of Palestinians during the 1948 war between Jewish and Arab sides in Palestine and later Israel; and finally, the dispossession of Jews in Arab countries. What is the connection among these three distinct occurrences? And do these events, individually or as a causal chain, shed light on the unprecedented scale of forced displacement today? David N. Myers is the Sady and Ludwig Kahn Professor of Jewish History at UCLA, where he also serves as the director of the UCLA Luskin Center for History and Policy. Through its support of research, teaching, and public programs, the Center for Judaic Studies and Contemporary Jewish Life seeks to foster scholarship in Judaic Studies, enrich undergraduate and graduate education in the liberal arts and Judaic Studies, and provide resources for continuing education and community service.